Ah yes, the humble and ever-reliable pen knife. One of the essential’s any man (or woman’s) tool bag arsenal. Originally, these were designed to thin and point the tips of quills so they could be used for dipping pens and at a later stage could be used to re-point or repair the nib. At the time, they did not have folding blades per say, but looked like wood knives and scalpels, with a long handle and fixed, short blade at the end. In the following post we look at what we believe are, in our most humble opinion, the top 9 pen knives available at the moment. After we have looked at these excellent knives in a bit greater detail, we will look at two important discussion points – the difference between pocket knives and pen knives and tackle the subject of carrying these items in public. 110 Famous from Buck Knives is something of a legendary pen knife. One of the top sellers on Amazon and renowned for various reasons. It features a razor-sharp 3-3/4 inch 420HC stainless steel blade that is not only powerful and provides excellent edge retention, but it is also resistant to corrosion. This blade is perfect for slicing, piercing and all detailed cutting work. With a lock back mechanism, the blade is locked in place when opened to make it safer and stronger to work with. This knife really is a piece of American history. 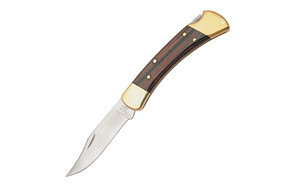 It has been made for over 50 years, and is one of the bestselling knives for most of that time. It has a classic and very sophisticated walnut handle with brass bolsters for a nice finish. For the price you pay you are not only getting the knife though, you are also getting a genuine leather sheath that just completes the look. There is also a lifetime guarantee on this knife. So if you want style elegance and strong, but safe cutting power, give this knife some serious thought. First up, from the highly reputable company, Columbia River Knife & Tool is the M16-01KZ folding spear point straight edge knife. Constructed from a dual stainless steel Interframe liner and nylon scales filled with glass, and torx fasteners – this is an extremely rigid and robust work knife handle. The knife itself is made from 8CR15MoV stainless steel with a high carbon level which allows for easier field sharpening and a great combination of edge-holding and toughness. This knife is perfect for most fine carving and cutting tasks. It features the Carson Flipper, which not only makes the blade opening quicker, but doubles as a protective guard when it is fully open. 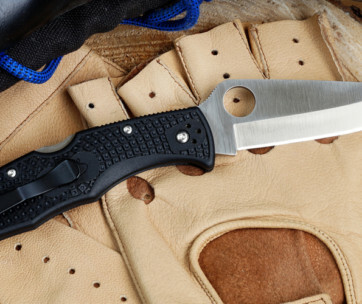 Columbia River Knife & Tool are renowned the world over for designing and constructing ever-reliable and handsome knives and other utility items and tools. Therefore, if you are looking for a robust, durable and highly secure knife that comes with a lifetime warranty, then this might just be the one for you. 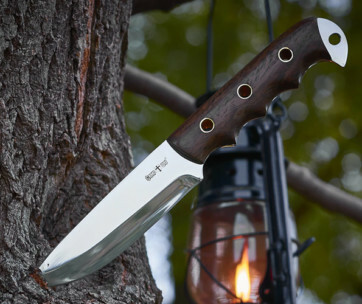 Although a favorite with knife collectors, the Trapper was a blade that was originally designed and constructed for people who trapped small game. It is a pocket knife that comes with two full-size blades, one is a long Spey blade and the other a more slender clip blade. This is a versatile and very good-looking piece and can be used for anything from food preparation to everyday tasks such as opening mail and boxes, fishing, cutting rope and of course hunting. Case know what they are doing when it comes to creating and manufacturing practical, functional and reliable pen knives that don’t look too bad either. 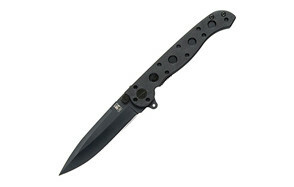 The blades themselves are Tru-Sharp as-ground surgical steel and the handle is black and 4.13 inches long. With a lifetime guarantee, this is worth considering if it meets your budget. Spyderco are known for performance-based and highly functional knives and this particular model is no different. Featuring a fully-patented Emerson blade-opening, the Spyderco Endura 4 Wave Plain edge folding knife is perfect for a number of different uses and very sharp indeed. The Emerson opener is undoubtedly the most intriguing part of this particular knife. It features a hook that curves from the knife’s blade top and whenever you remove the Endura from a pocket, the hook catches and quickly opens the blade. The blade itself is a saber-ground flat VG-10 steel blade with a very strong and sharp tip and the handle is a joy to hold, made from fiberglass and reinforced-nylon with Bi-Directional texturing molded into it. this makes it a dream to hold and use. Ladies and gentleman, take a look and behold the beauty of the Skeletool. It kinda looks like something Skeletor from He-Man would have used or one of Dem Bones skeletons would have used if they were really into wood carving and hunting. Leatherman are known for manufacturing reliable and highly functional knives and the Skeletool KBX pocket knife is no exception. This is a lightweight and slim knife that has stripped away a lot of unnecessary elements to make sure the essentials are on point. Pardon the pun. The 420H stainless steel blade is extra strong with a good edge and has a serrated section which is handy. As well as looking extremely cool, the skeleton-style blade and frame design helps reduce the knife’s weight. Who can argue with a useful, powerful and gorgeous looking knife that only weighs 1.5 ounces. This pocket knife comes with Leatherman’s generous 25-year guarantee and features a bottle-clip for securing it inside your pocket safely and opening a bottle of the cold stuff when you are taking a break from your work. It has to be said that this knife in particular looks like a weapon from a film about the Krays or something, but trust us, it is actually an incredibly useful tool. The Cold Steel Lucky folding pocket knife is made in Italy and is functional as well as very good looking. Although it does look menacing when both blades are opened, but thanks to the tough opening and closing mechanism, it won’t ever open up on you by accident and cause you injury. They have designed and manufactured this knife to be as safe as possible. Perhaps the most enticing and best thing about this knife is the fact that it is incredibly versatile, thanks in particular as it offers you the option of a serrated or plain blade to work with. Let’s put it plain and simple, if you are looking for an affordable and reliable knife for the various tasks you need to complete, then this may be a great and sharp tool for you to consider. The next sharp and versatile baby on our list is the Benchmade Proper 319 knife and it has to be noted that this is one of the more expensive models mentioned on our list. If you have a modest budget, you may want to look at a different knife. However, if you are interested in owning a very high-quality knife featuring a stainless steel CPM-530V blade, keep reading. There is so much to love about this knife, and it doesn’t cost you anything to look, so why not click on it? The Micarta handle and the overall design of this slip-joint knife, makes it look and feel like its from a by-gone age when knifes were used for very manual and intentional acts. It can be used for virtually any function you need it for, from slicing and cutting to other everyday use. It’s compact and lightweight, making it easy to carry and comes with a Lifetime Warranty and LifeSharp service, to keep the knife in its best and sharpest condition. Whether you need it sharpened or repaired, Benchmade are happy to help. As we said, the price may be off-putting, but when you consider the online reviews and ratings and the versatility of it; it’s easy to see that this is a knife that is great value for money. Benchmade are known for making sterling products, so their reputation proceeds them and means that they can ask for a bit more money. 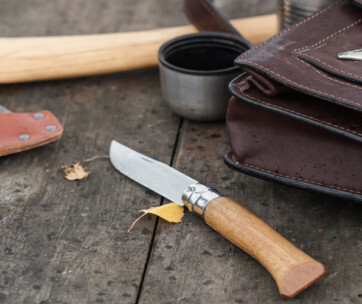 Opinel have been designing and fashioning knives since 1890 and little has changed in their approach to creating blades that are easy to use, efficient, sturdy and very simple. Opinel Everyday Carry Locking Pocket Knife features an anti-corrosive element that protects it and keeps it in good condition for longer, due to the chromium component and very strong Sandvik 12C27 modified stainless steel blade. With a carbon content of around 0.40% it provides you with an amazing cutting edge. The handle is made from Beech, which is easy to work with, durable and tough. If you are concerned about the sourcing of materials in things you buy, around 95% of wood used for Opinel handles come from French sustainable-managed forests. Unique to this knife from Opinel and all of their models is the Virobloc safety ring, which was invented in 1955 by Marcel Opinel. It consists of two sections, a sliding one and fixed one and as a further safety measures, you can lock the blade open when using it and lock it closed when you are carrying it and not using it. We round out our list with yet another higher priced pen knife. 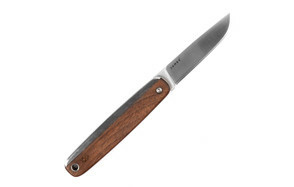 The James Brand County Knife, although expensive, is an elegant and practical piece that has a handle comprising of both stainless steel and walnut wood. It features an excellent straight 2.5 inch 12C27 steel blade that is well balanced to have resistance to corrosion, sharpness, robustness, strength and toughness all in one sophisticated package. With a clip-less, very slim and compact profile, this knife will slip into your pocket effortlessly and is then easy (and safe) to take out when you need it. Although it is at the higher end of the price range of knives, if you want to spend well on one knife in particular and don’t want to regret it, we feel this might just be the one to do it with. Let’s be clear, The County Knife from The James Brand straight knife is a well-designed, well-manufactured and engineered pen knife that we are sure will not let you down, for whatever you intend to use it with. Now that we have looked at our top 10 picks for pen knives available, we are going to look at two often misinterpreted subjects surrounding pen knives and pocket knives. As you look through the many knives for sale and the ones we have highlighted about, you will undoubtedly notice the fact that two different phrases are used often – pen knives and pocket knives. Interestingly, although the terms pen knives and pocket knives are used interchangeably by a lot of people, they are actually a little different from one another. Yes, they are both compact and both really can fit in your pocket, but structurally and functionally they differ. Let's look at pen knives to begin with. A pen knife, traditionally, was used to cut a quill pen. It had a small blade with a razor-sharp edge. In order for the blade to hold an edge, it was very firm. This made it prone to breaking and chipping because it was incredibly brittle. However, pen knives often get damaged because people use them for the wrong purposes, like sharpening pencils etc. Now, let's look at pocket knives. A pocket knife, is a more robust and tougher cutting tool. As they are not nearly as brittle, they are used for tasks such as cleaning out pipe bowls, removing the insulation from around electric cabling and wiring and whittling pieces of wood down. As well as a seemingly endless list of other jobs. Another way to tell them apart, is in their blade construction. Pen knives for instance have 2 blades that are both pivoted at opposite ends from one another. However, if they are pivoted at the exact same end as each other, it's actually a pocket knife. Furthermore, if it has more than 2 separate blades, it is also considered a pocket knife. However, many manufacturers use one or the other to mean the same thing. Unfortunately, although pen knives and pocket knives both have fairly non-criminal and very practical uses, due to the fact there have been numerous incidents involving blades, the laws on carrying these kinds of implements has been tightened over the years. If you work with knives at all or your work requires you carrying one from one place to another, in public, it is important to understand the rules and regulations to avoid any unnecessary trouble. What are the laws on carrying pen knives then? It is illegal to carry ANY bladed or sharp instrument or tool in a public area, with the distinct exception of a fold-able pocket knife with a blade smaller than 3 inches long. A lock knife, which can be classified as a similar tool as a pocket knife, is not prohibited, no matter the length. Although the police and governmental authorities do not consider these items to be offensive as such, carrying them is. The one good thing though with the law is that it is not completely total or without some leeway or understanding. They are in place so that it can be ascertained whether an individual had a good reason for carrying one or not. For instance, if you are hillwalking through the Lake District or planning to climb Ben Nevis or Mount Snowdon, it is understandable that you may need a knife to carry with you for prepping food or cutting rope and other shelter equipment etc. So don't worry too much if you have a genuine reason for carrying a knife or some other sharp instrument. It doesn't mean you will be arrested, charged and thrown in the slammer. The law doesn't work like that, thankfully. Crucially though, if you are caught in possession of one of the above instruments in a public space, without good reason, you could face a prison sentence of up to four years. So make sure you can explain clearly and thoroughly why you have one in your possession and always try to be polite and calm when dealing with police. So now you know what we think are the nine best pen knives, you know what the difference is between pen knives and pocket knives and you also know about the laws regarding carrying them.